Draughts around doors and windows are responsible for about 15% of heat loss in a typical house. Draught proofing will go a long way to eliminating this problem and will make your house feel warmer, reducing your energy bills, and saving you money. 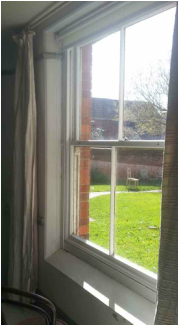 We use a tried and tested draught proofing system to seal the gaps around timber-framed windows and doors. It's reasonably priced and quick to fit. Seals are fixed round the gaps around the doors ensuring that the door or window can open and close effectively. The seal of choice is the Q-lon range of seals which are made of soft foam enclosed in a non-stick skin. This means that they continue to work even if painted. Cost from just £20 per window depending on size/complexity.